We offer you here a glass of high-class forest honey made from the beekeeper directly on the farm in the nice High Puster Valley. 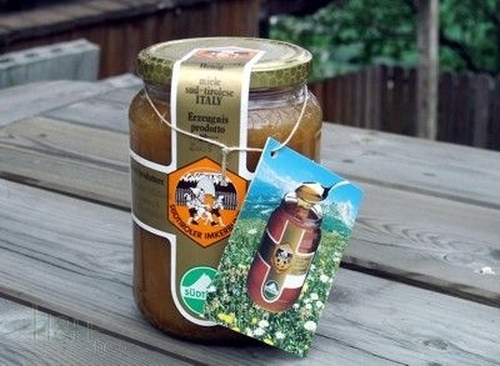 Real South Tyrolean honey is a natural product, accumulated and processed from the bees and got from the beekeeper. During years with forest national costume the bees collect the honeydew from the young impulses of the extensive spruce forests of the High Puster Valley. The dark, brown to auburn honey contains a high portion in malt sugar and crystallises, therefore, often only after half a year. Forest honey has a spicy, typical and distinctive taste. This honey is free of any additions and is estimated very much because of its many natural active substances. So that also all good properties of this pure natural product are preserved, it is treated by the beekeeper appropriate and carefully. Absolute cleanness and hygiene, chill storage as well as the avoidance of heat damages are required with the liquefaction. The natural honey, in particular pure blossom honey, crystallises in the course of the time. Preserved honey can be newly liquefied with max. 42 ° C in the bain-marie without appreciable high-class loss. Keep honey chilly and darkly; close carefully opened honey glasses. Recommendation: Who prefers liquid honey, can liquefy again preserved honey by light warming up in the bain-marie to maximum 40 ° C. Many enzymes and active substances are destroyed by stronger heating up. Given in the still liquid condition in the freezer compartment of the deep freezer, the honey camps down there for years freely of loss and does not crystallise. I prefer forest honey . This honey is very good . It has such a characteristic taste , which I didn\'t find find in another sort of honey .